RaspberryPi was invented as educational device to inspire children to study computer science. Nevertheless, in a couple of years it has become the toy of computer scientists, engineers and curious of every age. 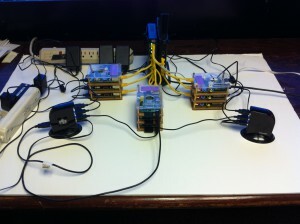 This project is our successful attempt to build an educational RaspberryPi Cluster composed by one main node and eight computational nodes. In this post we try to explain step-by-step our work in order to allow anybody to build its own cluster. First of all, we need to make a detailed list of all parts that we have to put together to build our cluster. In the table below are listed all pieces and the websites where you can find them. Amazon and eBay are the most popular electronic e-commerce websites where all these parts can be found easily and for a low price. The prices and the links indicated in the table are the information at the time we built the cluster. At the moment you are reading this post could be out-of-date. Use the name of the part to look for more updated information on Internet. Note that the “dd” command is very powerful and could overwrite any partition of our system. We must be sure that we are selecting the right device. For more detailed instructions refer to the Raspberry website. There are guides to perform this operation with different systems (Linux, Windows and Mac OS). Our SD card contains now the Raspbian Debian Wheezy distribution. Now we can put the SD card into the slot of our Raspberry Pi, connect keyboard, mouse and a monitor or a TV with an HDMI cable and turn it on connecting the Micro USB power supply. The first time that we boot our Raspbian operating system, we will be presented a configuration menu. We will choose “Expand Filesystem” to ensure that all the SD card storage is available to the OS. Below the screenshots of the different phases. Once the filesystem has been expanded we can login in the system with username “pi” and password “raspberry“. Now, we need to configure the network settings of the operating system. 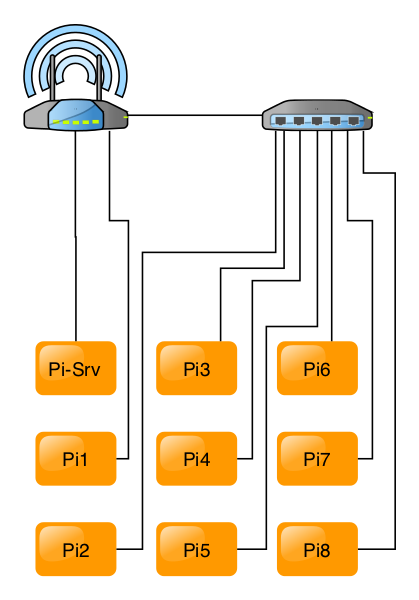 Our cluster will have the network structure shown in the picture. We use the NETGEAR 8-Port Gigabit Ethernet Switch to connect seven of the nine nodes, the remaining port is used to connect the switch to the BUFFALO AirStation N450 Gigabit Wireless Router and the other two nodes are also connected to the router. In our project we use a wireless router so that we can have a “mobile” cluster for educational purposes. You can modify the network architecture to better fit your needs. As we can see from the network diagram, there is a main node called “Pi-Srv”, it will be the head of the cluster to submit the jobs on the other eight computational nodes. Furthermore, the main node will share its own filesystem to the other nodes, in this way there will be only a control point (the “Pi-Srv”) to compile and run the programs. We start the configuration assigning an hostname and a static address IP to each node. The table summarize the network information for each node. The information about address and mask must be inserted in the configuration file under “/etc/network/interfaces” for each node, while the hostname will be inserted in the configuration file “/etc/hostname“. We also edit the file “/etc/hosts” to give each node information about the hostname of the other nodes. Now we are configuring the head node, so our configuration files will look like shown below. At this point we have the same OS and configuration for each one of the nine RaspberryPi. The only operation that we need to do is to change the IP address and hostname according to the table. We can follow the same steps we did for the configuration of the main node. Once this phase is complete we have all nine nodes ready to take part to the cluster. In order to assembly the cluster let us follow the diagram shown previously and the pictures below.